On Friday 6th October, Mel from the Greyhound Trust visited school to inform us all about greyhounds. She gave a really interesting and exciting talk. Thank you so much for welcoming me to your school on Friday morning. The children were amazing and so well behaved, and as for young Nelson, he was an absolute star! It was a real privilege to see him in action and to witness the positive effect he has on the children. The school has a really vibrant and happy feel to it; I hope to come back in the future! Nelson has made the papers! Just before the summer holidays, the Kent Messenger came in to find out about Nelson. 'Read all about it' by clicking on the link. 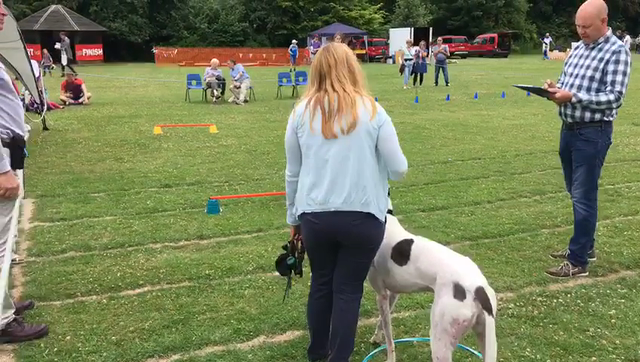 Nelson entered his first doggy agility competition and came third!!! Well done Nelson!! Nelson's rosettes for most handsome dog and doggy agility! This week we had the Dogs Trust visit school to provide us with 'Be Dog Smart' sessions. Jo gave us lots of useful advice on how to behave around dogs. At the end of the sessions the children got the opportunity to stroke Paddy which they were all thrilled about! Having the sessions will help those who are nervous around dogs hopefully feel more confident around Nelson! Nelson has made a massive impact on all of us here at school! This week he has been taken for his lunchtime walk with Mr Paterson and two children from each year group. On Monday we saw two year three children and Tuesday two year four. We have chosen children who always do the right thing in class and persevere in their learning! As you can see from the letter above, it has made a real difference! Nelson has really enjoyed his first day at school and meeting many of the children! After meeting Nelson, Luis, in Year Five, felt inspired to create the amazing models you can see in the picture above! Well done Luis! He has also helped settle some of our children who suffer with anxieties. Nelson has arrived! We collected him on Bank Holiday Monday from Croftview Kennels and it didn't take him long to settle in. Over half term Nelson has enjoyed going for walks and popped into school to have a sniff around and accustom himself to his new surroundings. He is really excited for the arrival of the children after half term and hopes to help with the learning as well as social and emotional well being of our school community! Nelson, a 4 year old retired greyhound, will be joining the school after half term. He will live at the back of Mrs Pike's office during the school day and go home with Mr Paterson of an evening. We have worked closely with Croftview Kennels in Harvel to choose a dog that would be perfectly suited to working with children. Although we can't say that a dog would never harm another person, we have produced a policy and risk assessment that will reduce any risks to a minimum. All contact with Nelson will be strictly supervised and we have the Dog's Trust visiting in June to educate the children in how to behave around dogs. If you have any concerns, please read the FAQ below, the risk assessment and policy. Please speak to myself if you have any further queries!